Wing span: 2 3/16 - 2 3/4 inches (5.6 -7 cm). Identification: Antennal clubs are orange. Upperside is brown with dark eyespots at the margins. 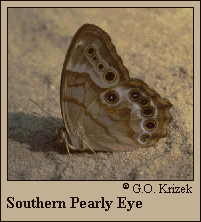 Underside is light brown; submarginal row of 4 spots (Florida females may have 5) on forewing is slightly curved and brown line inside this spot row is straight or zigzagged. Spots are encircled by diffuse white. Life history: Males perch on tree trunks, sometimes head downward, to wait for females. Eggs are laid singly on or near the host plant; caterpillars feed on leaves. Older caterpillars hibernate. Flight: Three broods from March-October. Caterpillar hosts: Bamboo: giant cane (Arundinaria gigantea) and switch cane (A. tecta). Adult food: Sap, rotting fruit, carrion, dung. Habitat: Shady, damp woods near stream-fed swamps. Range: Eastern Oklahoma and eastern Texas east through the southeastern United States. Conservation: Its swamp forest habitats are gradually disappearing in the Southeast. Management needs: Conserve and minimally manage all remaining habitats. Hopkins University Press, Baltimore. 294 	pages, 54 color plates.